Gaarelu is synonymous with the word Festival or Guests. When we were kids Amma used to make them only during festivals or when any special guests are visiting us!!! 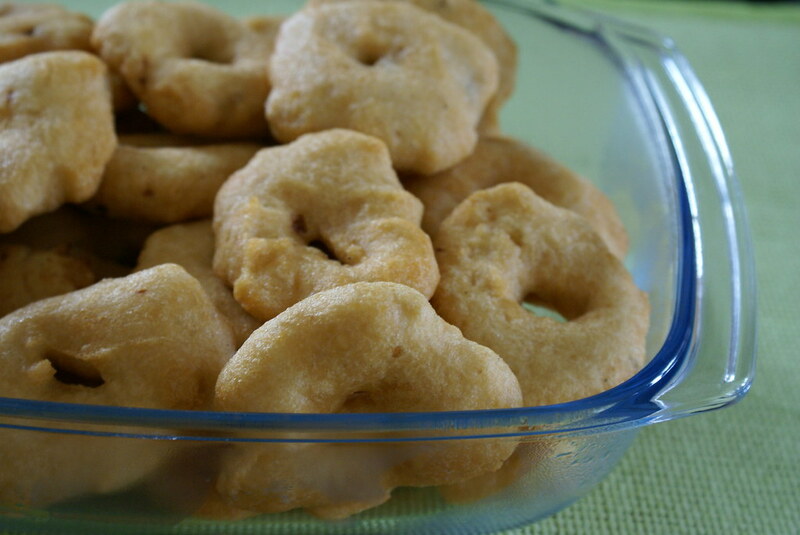 Gaarelu/Vada/Ulundu Vada is a very famous South Indian breakfast which is accompanied with Coconut Chutney and Sambhar. Soak Urad Dal in enough water overnight. Grind into a soft paste, using very little water. The batter should be very thick, not like dosa batter. Add ginger, onions, chilies and salt to this and mix well. Take a deep pan or kadai and heat oil for frying. Wet your hands and take a lemon sized ball and flatten it and make a hole in the center. (You can use a plastic sheet or a banana leaf, to make things easier). Slowly put it in oil and deep fry on both sides till golden brown. Serve hot with coconut chutney or sambhar or even chicken curry!! If excess water is added while grinding, it is difficult to shape and drop it in oil. Every time before taking batter into your hands, remember to wet your hands with water. This prevents the batter from sticking to your hand. Since you wet your hands each time and put them in the bowl containing the batter, after some time, the batter is likely to become thin. So it is better to work on the batter batch wise. “Thinte Gaarelu thinaali, vinte Bhaaratam vinaali” is a very famous telugu proverb. And this says it all!!! Spanz..naaku chesukune opika ledu so naaku 4 garelu kavali(dietinglo vunna kabatti)….new layout looks awesome…. I love vadas and true whatyou sayabout them that it was made when there are guest at home.Just give me few with the chutney …. hey I can live on those everyday!! !they look absolutely delicious!! love your new header, u’r blog is amazing with autumn feel to it!! Of all the vadais this is my favorite. Looks very good Cinnamon. Your new layout is totally awesome, its spring here too! wow love these vadas soooo tempting! Wow! beautiful wall paper and the blog header looks cool. I like the colors. Please send the bowl of gaarelu with the coconut chutney across. 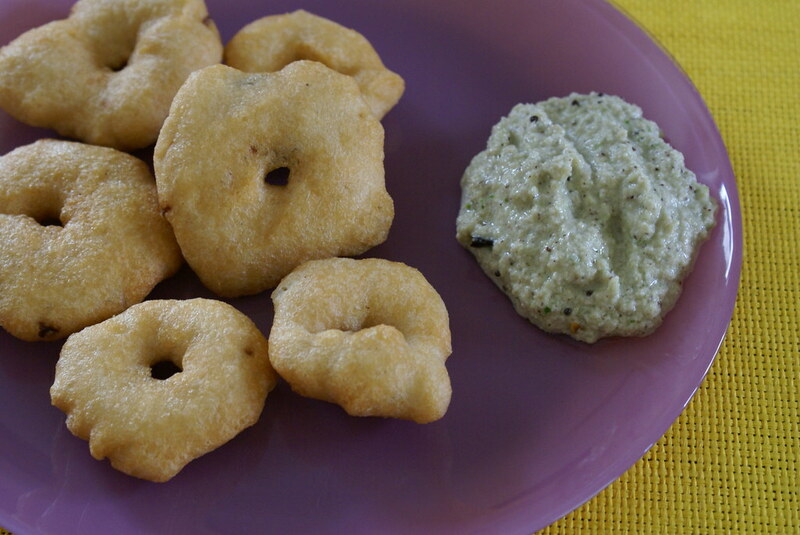 yummmm….that coconut chutney looks delcicious..and the vadas? heaven! I love gaarelu.The page is looking good. Symbolising coming fall. I simply adore these uddina vadas! Iddly with Uddina vada is a great combo! I would most definitely enjoy these for breakfast or anytime. Your header is exceptionally beautiful and seasonal. Love how you changed with the season. Lovely pictures. Absolutely delicious vadas. Love your page header. Looks very neat and attractive. Vadas with coconut chutney- Perfect breakfast and your plate looks too tempting! hi ur garelu looks superb…. Lovely website, and fab recipe. I wonder if you’d post your coconut chutney recipe as well? A ‘novice’ cook like me would really appreciate it. I likedthe saying in the title. I never thought of autumn that way. I made these today. They turned out great. I always thought this was a difficult thing to make but…. it’s quite simple.